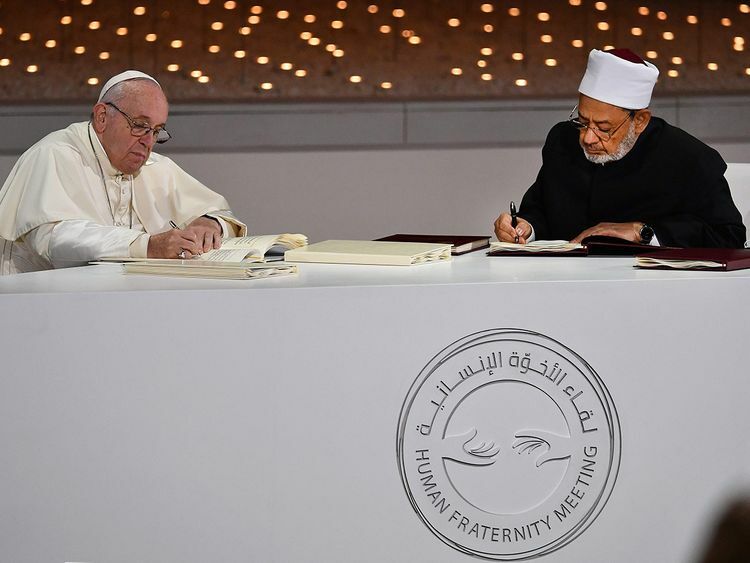 In years to come, a mosque and church will stand side by side in Abu Dhabi, their cornerstones laid by Pope Francis, the spiritual leader of the world’s Catholics, and Dr Ahmad Al Tayyeb, the Grand Imam of Al Azhar. But for generations to come, people will look too at the Abu Dhabi Declaration signed by the two and note it as a turning point in laying the foundation for a new era of building peace, ending extremism and voiding the philosophy of individualism. The charter is indeed a remarkable document, and the very fact that it was signed in Abu Dhabi during the first visit ever by a pope to the Arabian peninsula makes it all the more poignant and powerful. At its heart is the unassailable truth that dialogue forms the very basis of building a future free of conflict. That dialogue — the ability and freedom to believe — forms the basis of our successful interaction at every level. There are no ties between religion and terror — no symbiotic relationship — and dialogue dissolves divisions. That is the very basis of lasting peace. How true that tenet is, and how powerful it is in confronting the very real problems that afflict so many across this Middle East. How different would this region be if those words were taken to heart, acted on in earnest by divided and embittered nations and peoples striving to achieve co-existence, tolerance and partnership. And peace. If dialogue can provide the building blocks for a future free of conflict, it faces challenges in the real world and realpolitik of a region wresting with multiple factors: an administration in Washington that is unsure of direction; where the regime in Iran has but one aim – to spread its nefarious agenda through supporting extremists and terrorists; where Ankara is determined to influence people and politics beyond its borders; and where extremists seek to subvert any peaceful or constructive actions or agenda. The words of the Abu Dhabi Declaration make for undeniably powerful reading. The real potency, however, is in its ability to reach those with terror in their minds and evil in their hearts. The reality is these individuals must hear the message of peace and take it to heart. Only when dialogue is embraced and freedom of beliefs truly acknowledged, there might come the day when we all, as travellers together on the pilgrimage of our life, share the ark of fraternity as envisaged by Pope Francis. Inshallah.